At her first council meeting, Teresa Belmonte announced that the pay for councillors will be reduced. Four councillors will receive 690 euros per month and she will get 1,700. The other two members of her party will receive 200 euros for each of the two meetings that they attend each month. Sadly, because of the economic situation, there will be no money for the various groups in the town such as the Fiesta Commission and the Band. The lady mayor will take responsibility for Public Safety, Public Works, Civil Protection and Participation. Antonio Manuel Gonzalez will be responsible for Hacienda, Heritage and the Treasury; Elena López will take charge of Social Welfare; Antonio José Meseguer - Planning and Environment; Adrian Gonzalez - Works and Health; Javier - Sports and Festival Days; Alejandra Moya - Culture and Protocol. We first got to know Eloy and Pilar when they came to our house last year asking if I could take pictures of their daughter Patricia who was to be Junior Queen at the Fiesta for San Joaquin. Throughout the week I captured many photos of Patricia and the rest of the family taking part in the scheduled events. Since then I have further photos of them taking part in the procession of the Virgin Mary. The whole family appear in my video of the Encuentro and again they feature in one of my photos from the procession for Corpus Christi. Last week they returned to our house, this time to ask me to take photos of their 25th Wedding Anniversary. 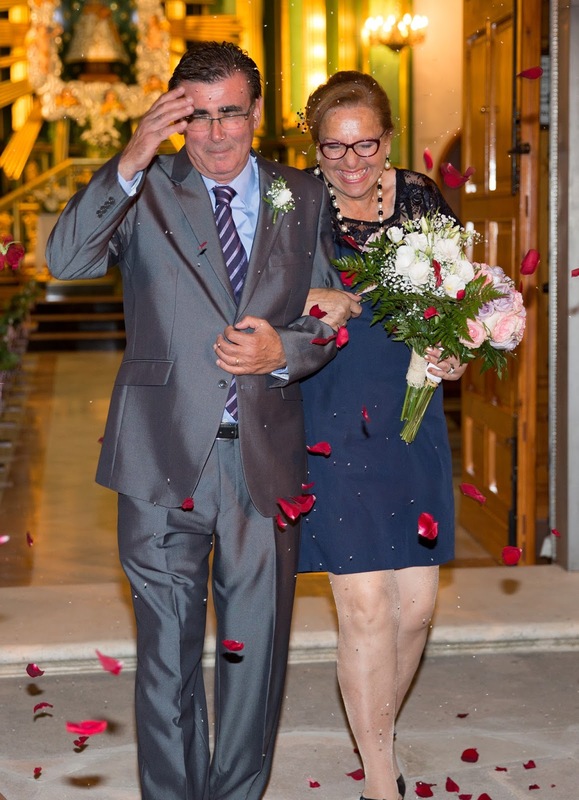 Although the celebrations took place in Benejuzar and at their house on Saturday, today is the actual day for their anniversary. We send to them our best wishes and our hopes for many more happy years of marriage. If you were planning to go to the beach you might have trouble finding a space there let alone somewhere to park the car. 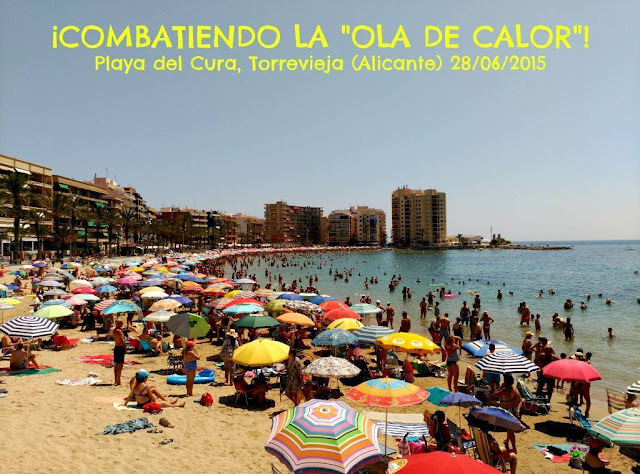 This is what the beach at Torrevieja looked like yesterday morning. We couldn't watch the live stream from Glastonbury because our Spanish IP address prevents us from accessing BBC iPlayer UK version. What we missed last night was one of my favourite bands, the Who. Along with the Rolling Stones and the Beatles, they shaped my youth. I never got to saw the Beatles but I have seen the Stones live at Sheffield and at Twickenham. Finally, this year I got to see the Who in Manchester as part of the 50th Anniversary Tour and they were amazing. On Saturday, Kayne West declared himself to be the greatest living rock star to the Glastonbury crowd. Pete Townsend put him right on that score last night. Hopefully, at some point, I will be able to get a DVD or a download from YouTube of the set the Who played last night. 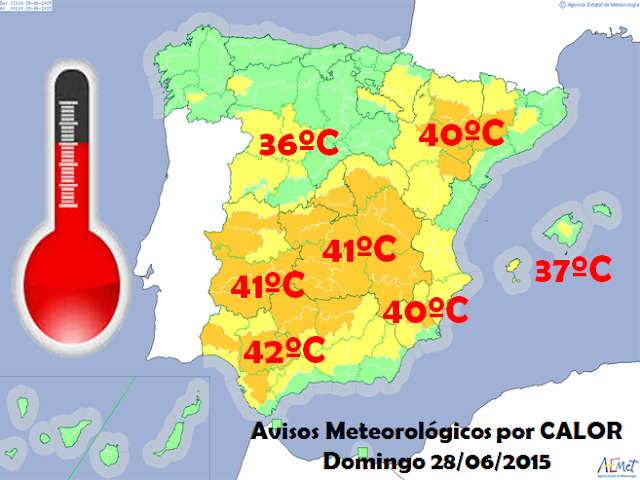 As the comedian Peter Kay said, " I like it hot but not that hot!". The forecast yesterday showed that it should have starting to cool down today but that has been changed. If anything, it could be hotter today than yesterday. All the usual advice, keep out of the sun as much as you can, wear light clothing, drink plenty and eat small light snacks. If you really must go outside, then slap on plenty of sun cream and wear a hat to protect your head. It is perhaps not the best day to start building that extension or reforming your garden. On the plus side though, the washing will be dry almost the moment you hang it out. 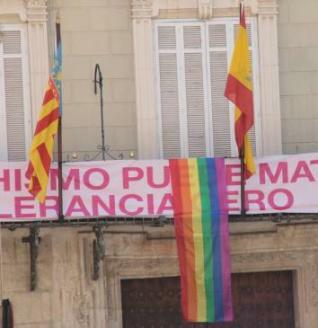 In celebration of Gay Pride Day, municipalities of the Vega Baja have adorned their town halls with rainbow flags. 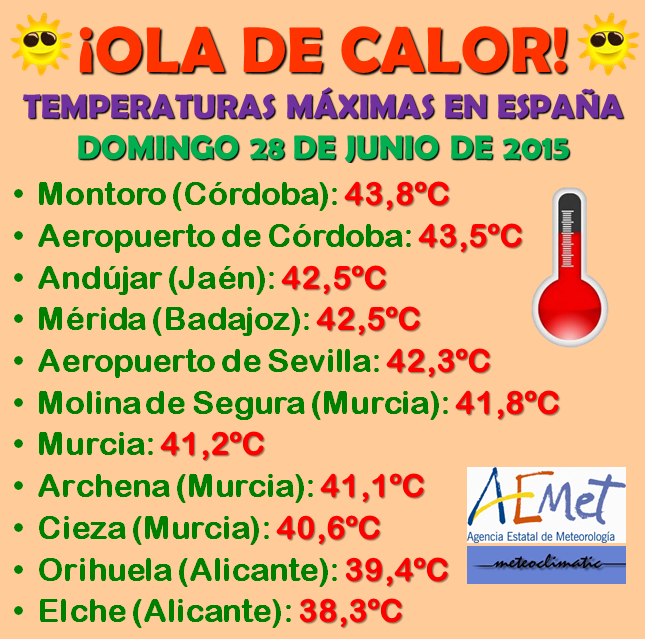 First off were Torrevieja, Dolores and Callosa de Segura. These were then joined by Orihuela, Cox, Algorfa, Los Montesinos, Almoradi and Guadamar del Segura and towns like Rojales are set to follow suit. For people of our age this is a strange phenomena. When we were growing up, homosexuality was illegal and was therefore something that people kept quiet about. As the law was changed, it became tolerated but not necessarily condoned. Now the tables are turned and it is apparently something to be proud off. Even those who are not gay have adopted the rainbow flag on their Facebook profiles to celebrate Gay Pride Day. The swimming pool/restuarant at La Pedrera (not the Camping) are offering a free one week pass to the person who posts a selfie at the pool that gets the most likes on Facebook. If the subject of this photo is the standard of the competition, there is no chance for me to get even one vote so I won't be bothering thank you! 1) Avoid having poles growing out of the top of heads. 2) Placing the interest close to the centre does not work in this instance. I would have cropped out some of that dead space to the right to bring the young lady's face onto one of the division of thirds. 3) The young lady's face is so much in the shade that we can't see her. Although it might sound odd on a sunny day, this is one occasion when the photographer should have used flash to add light. These are the kind of temperatures we might get at the height of summer. It isn't yet July and we are expecting a heat wave from the Sahara to raise the temperature in the south of the country. Looks like some parts could top 40 degrees on Sunday, we are forecast 37. Thankfully, by Monday it should cool down a little to 34 and then 33. My pool is at 28 degrees already and feels more like a warm bath than the chilling experience of a week or so ago. The new roundabout is complete so why is the road not opened again? The retailers on Duque de Tamames claim to be losing 90% of their trade whilst the road is closed in spite of the fact they still pay the same taxes. They also claim that the heavy lorries that have trundled by have left the tarmac in a bad state and want to know what will be done about that. The first meeting of the new council will take place on Monday, 29th June at 9pm. You will notice that item 3 concerns the the group that Maria Teresa spoke about at the meeting she held with us at La Terraza prior to the election. If you recall, she proposed that the different parts of the town should have a representative who would have the job of feeding information to the council and taking information back to their neighbours regarding council matters. She feels that would be more efficient and democratic than having a trail of people at her door expressing their own personal views. If this item is passed, as I suspect it will be, we will be asked to nominate a representative for Villas Andrea. We may even be asked to nominate 2; one to represent the English speaking people in our urbanisation and one to represent the Spaniards. I have no idea how people here want to proceed with this idea. Neither do I know who we might want to nominate or indeed who might be willing to act as our representative. I suspect, for this issue, we will need some sort of meeting. Whilst I know there are those who believe I am the spokesperson for Villas Andrea, that is not true. When I started writing this blog, it was intended to pass on information to my family and friends. The fact that so many on our urbanisation and elsewhere read it is a coincidence. As I have said several times, the views that I express here are my own, they are not meant to represent the views of others unless otherwise stated. Inevitably, there will be some who do not agree with my views and would want to express different opinions on matters - I know that. However, unless they make their views public, we will never be aware of them. What I am saying is that I would not want anyone to feel that I am trying to make a name for myself here and neither am I seeking to be the self appointed spokesperson. As they say in tennis, "the ball is now in your court". Talk amongst yourselves, decide what suits you best, call a meeting or get back to me if you wish and I will put your ideas on this blog for others to comment on. The only thing I would suggest is that we try to proceed in an amicable fashion without any of the slanging and back biting that has been our past experience. First we are told that the Houses of Parliament are in a very sorry state with crumbling masonry and a danger of part of the roof collapsing. If the MPs and Peers stay, the work could take 32 years and cost £5.7 billion to £7.1 billion. If they move out, the cost is reduced to somewhere around £4.4 billion. At the same time, Buckingham Palace also needs some major work done on it. The Queen's home needs to be rewired and have new plumbing. It also is well overdue for redecoration - the last time this was done was 1952. The cost for that would be about £150 million. Again, there is a debate about whether the Queen should move out or stay whilst the work is being undertaken. Yesterday afternoon you could hear the thunder rumbling in the distance. Looking towards Orihuela the sky was dark and stormy, towards the coast it was a nice summer's day. Would the storm affect Bigastro though? The answer came at about 5:30pm when the wind suddenly picked up and five minutes later the rain came lashing down. There was even hail in the rain. Half an hour later, the rain cleared and blue sky returned - the storm had passed. I've seen photos from Callosa where the streets were flooded and cars stood in water. 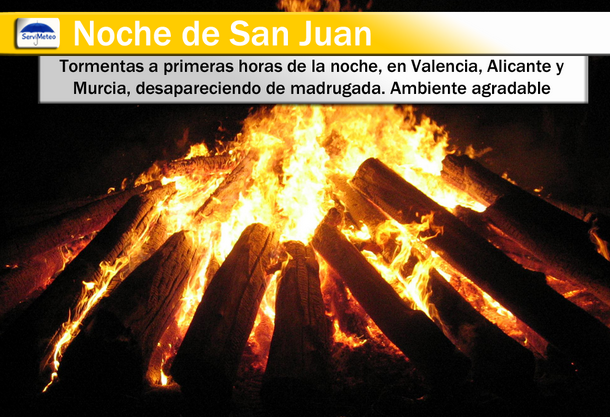 You might have thought that this would affect the "night of fire" in Alicante and other towns of the area but no. 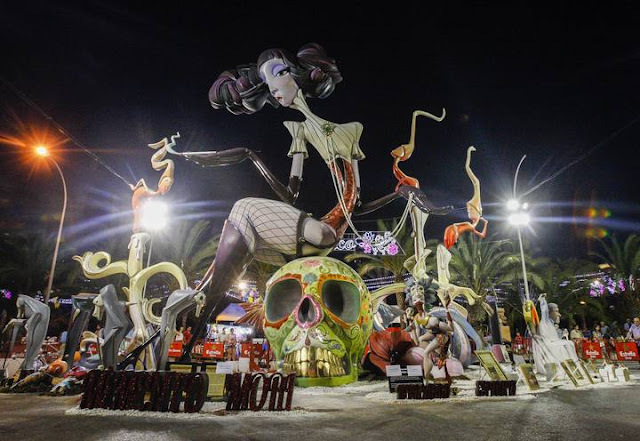 Some of the fallas posed danger as the wind blew them unpredictably but it didn't stop the bonfires on the beach at midnight. 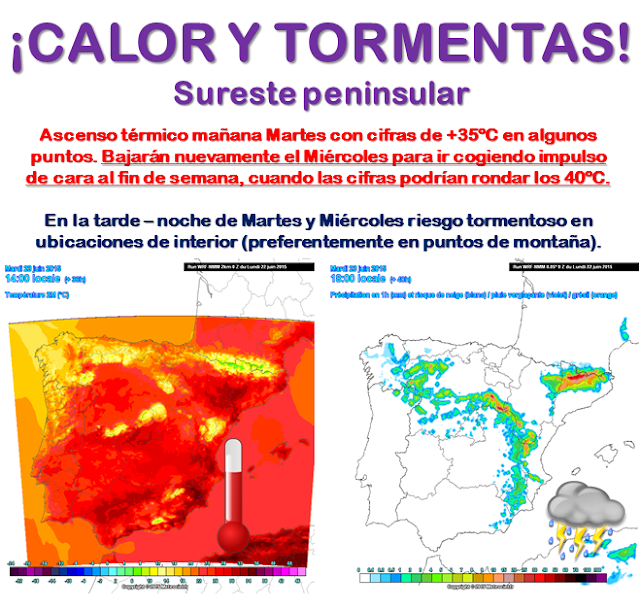 There is a warning that things could get hotter and with the heat parts of the country could experience thunderstorms. Calling all dogs (and their owners). 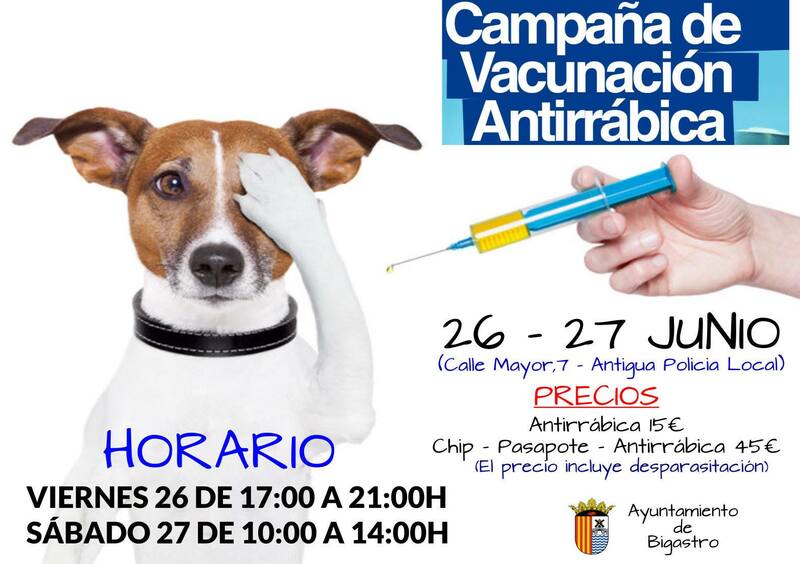 Bigastro Town Council has organised their RABIES CAMPAIGN 2015, for the vaccination of all dogs in the Municipality. The target date is Friday 26 (17:00 to 21: 00h) and Saturday 27 (10: 0-14: 00h) June in the outbuildings of the Local Police Station. With this measure, the Bigastro Council hopes to ensure that all pets in the municipality meet the legal requirements set out by the Ministry of Health for pets. NB As you can see, the cost of the vaccination is 15 euros but if you want your dog to be chipped with a passport at the same time, the cost will be 45 euros. Presenting the Comision de Fiestas San Joaquin 2015. There are some familiar faces in there along with plenty of new ones. They will have their work cut out to produce a fiesta on a limited budget that will satisfy old and young alike. My camera and I are looking forward to the results. Thanks to Alberto (on the left) for taking the selfie and publishing it on Facebook. Tis the season for burning. 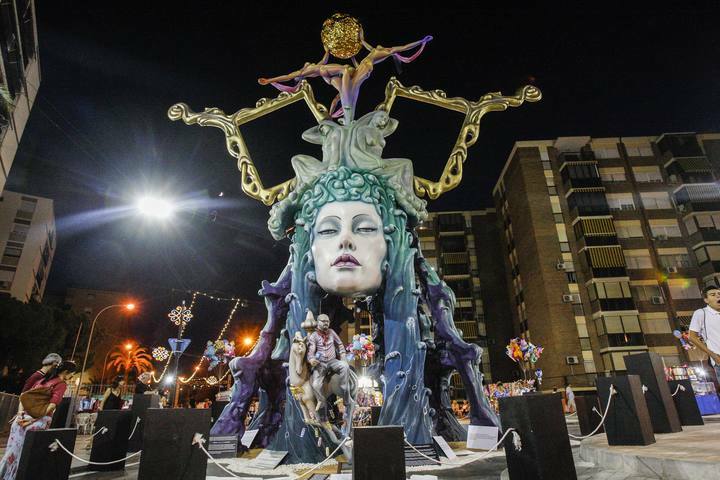 In Alicante and in towns like Torrevieja, June marks the Hogueras de San Juan. Originally the people would burn old furniture on the night of San Juan (24th June). 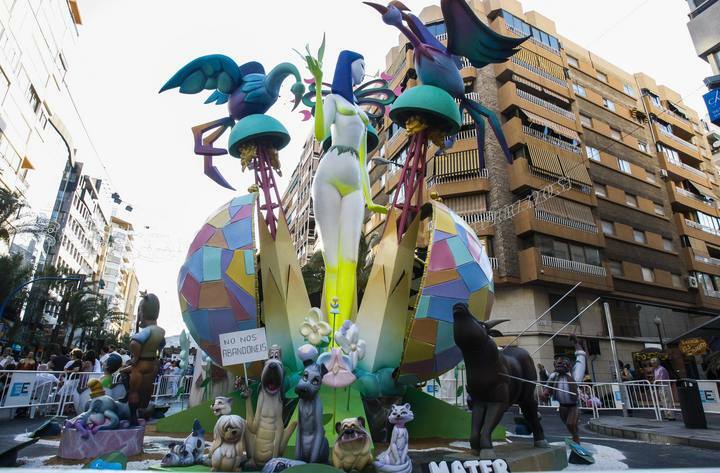 It has grown considerable since then with artworks that take many months to prepare being burnt in the streets. There are queens elected both junior and infant and of course great firework displays. 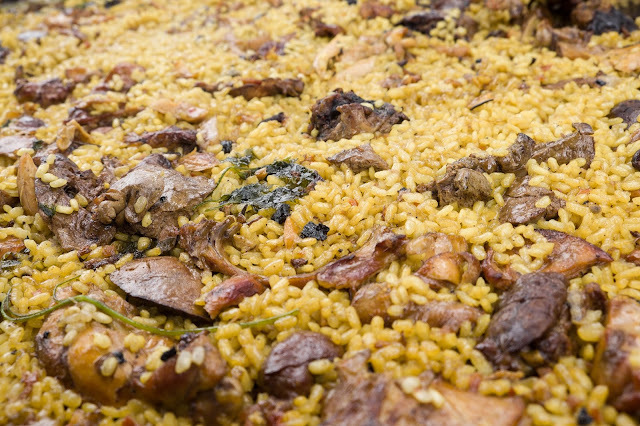 Paella or arroz as it is better known here on the Vega Baja is the dish that most of us associate with Spain. Its origins are in Valencia where peasants would prepare a quick meal in the field using rice and any meat, vegetables or fish they could lay their hands on. They would cook this in a large shallow pan (the paella) over a wood fire that generated a lot of heat but not for long. There was nothing fanciful about the food and it was certainly not gastronomic. It was cheap, cheerful and filling like migas (a dish based on dry bread crumbs). Even though most now use a gas burner to prepare arroz, the pan is still shallow and wide to allow maximum heat to the rice and minimum cooking time. The most important ingredient is the rice which by choice is apparently bomba. Small and round, it absorbs flavours well and retains its shape. Then come the other essentials like saffron, garlic, olive oil and either stock or water. Normally vegetables and or meat/fish are used but not always. Aficionados of the dish scoff at certain ingredients. Some will tell you that paella should NEVER contain chorizo or even onion, others will throw in whatever they feel like. If the result is not truly authentic what does it matter as long as it is tasty. 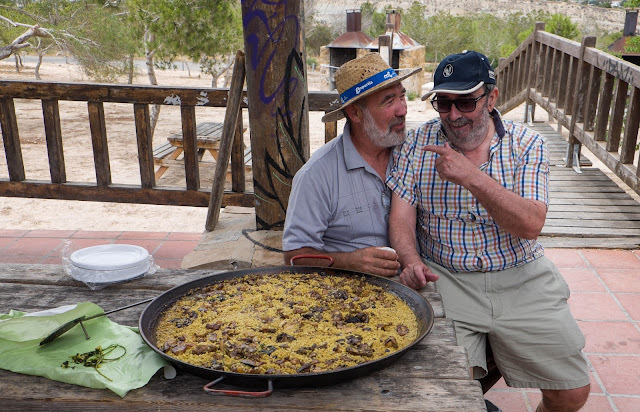 The arroz that was prepared for our Spanish class was traditional to the Vega Baja but even then, as Pepe said, there are as many variations on the dish as there are cooks preparing it. He even suggested that the dish would be different each time and went as far as to say that your mood at the time effected the final flavour. He claimed that cooking arroz over wood produced a more authentic flavour. Of course he could not use wood at La Pedrera because of the fire risk. Instead he had one of those double ring burners fuelled by gas. Since he was preparing arroz con conejo, he chose rabbits that he had reared himself - fed on vegetables. He told me that shop bought rabbits are reared on pellets and have a different flavour. Many recipes advocate stock rather than water and some even suggest that you should use a traditional Valencian fish stock and none other. Pepe used water. Pepe also told me that you should only ever use extra virgin olive oil. Pepe did not add any vegetables to his dish but there were a few herbs floating around including rosemary, basil and chives. As for spices, he added just a pinch of cinnamon and gratings from the shell of walnut. I did not see it go in but I am sure there must have been a pinch or two of saffron. As for cooking time, you need to make sure that the meat is thoroughly cooked in the broth before adding the rice. When the time comes, add the rice in the form of a cross in the centre of the pan. Stir to make sure it is distributed and well covered and then leave it. No more stirring! After 20 minutes, the rice will be cooked and it is time to cover the pan to allow the dish to rest for 15 minutes. Pepe used a tea towel, some use pieces of cardboard. I've read about using aluminium foil but Pepe advised against that saying that the vapour from the rice would condense on the foil and return to the pan. A cloth on the other hand absorbs the vapour. When I prepare a paella of arroz at Casa El Willo, the proportion of meat to rice is a lot higher. Those small chunks of rabbit with bones inside are very tasty but I prefer larger portions of chicken (thighs on the bone or drumsticks by choice). I also add a lot more vegetables including those white beans that you find in shops, green beans, peppers cut into strips and even sometimes frozen peas. Chunks of tomato are a must in my recipe. Instead of adding a variety of spices and saffron, I use sachets of Paellera from Mercadona. I like the aroma and flavour they produce. The result tastes nothing like the arroz that Pepe produced but then nobody who has ever sampled my version has ever complained. Not sure I would serve it to a Spaniard though! Having said yes to Microsoft's offer of a free for life upgrade to Windows 10, will I actually install the upgrade when it arrives? If I was running Windows 8 or even 8.1 the answer would be definitely yes. Those two versions of the operating system were downright unpopular especially with those like me who have a desktop computer with a mouse and keyboard. It was designed for use with tablet computers or touch screens and is shows. If I was running XP or Vista I would look at the ways I could upgrade to either version 7 or even 8.1 with the promise of a free upgrade to 10. Once support for XP ran out it became open season for the hackers to find ways to explore its vulnerabilities. Without the regular security patches from Microsoft, XP is a problem waiting to happen for those who connect to the internet. Vista is still being supported by Microsoft and is a lot better now than it was to start with but I would still want to be rid of it. The case for upgrading from version 7 though is less compelling. My last computer (a Dell running Windows 7) was mostly reliable and very rarely crashed to the "blue screen of death". When it did, it was the result of a rogue program rather than Windows itself. My current one is only a year old so it is early days yet - it too is running Windows 7. Having trolled the internet for advice about whether to go ahead and upgrade from 7 to 10, the best answers seem to suggest, yes download it but then wait. The possibility of a program or two not working properly or worse still a device driver that is not supported is real. Even though Microsoft have been testing Windows 10 for some time and have many users out there trialling it, there are bound to be some issues for the early takers. You have one year in which to install the system before the offer expires so waiting is not a real problem. According to Microsoft, Spain has the oldest computer software and hardware in the whole of Western Europe. At least 25 percent of all computers in the country still run Windows XP which is no longer supported by Microsoft. Most manufacturers of support hardware such as printers and scanners no longer manufacture compatible equipment. Windows XP was first released on October 25th 2001. It was and is the longest running version of the operating system only being succeeded by Vista on the 30th January 2007. Vista proved to be a lot more troublesome than XP though so many continued to use XP rather than upgrade. Following Vista came Windows 7 which was stable and proved to be as popular as XP. Then Microsoft brought out Windows 8 which, like Vista, had more bells and whistles than the stripped down 7. Like Vista though, it proved to be unpopular and was replaced by 8.1 which revived features that IT users wanted. Users of Windows 7, 8 and 8.1 have been promised a free copy of Windows 10. Users will have noticed an item in their taskbar which allows them to register for this so that once it is available on the 27th July it will be downloaded ready to be installed when they are ready. Notice though that the free offer leaves out those 25% of Spanish users who are still running XP and those who upgraded to Vista. Microsoft say that Windows 10 will be the last version of their operating system. Instead of releasing further versions, they will continue to update the one that you have automatically. 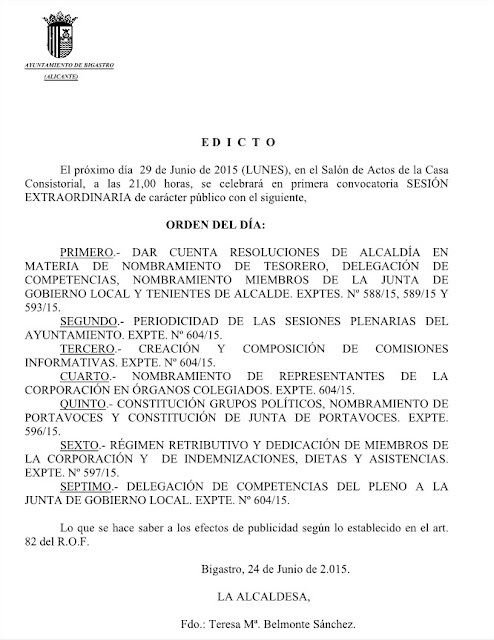 A study by Linea Directa showed an 80% increase in fines on the roads of Spain between 2007 and 2013. Many of them were for minor infringements which to many seem like trumped up charges. I spoke to one person who was fined for driving in flip-flops which are said to be unsuitable footwear. Some of the fines were even more bizarre than that, like the driver who was fined 80 euros for chewing gum. The report said that his attention was distracted by fiddling with a chewing gum packet. In a later case a driver was also fined 80 euros for biting his fingernails at the wheel. He was accused of not maintaining freedom of movement at the wheel. Is it any wonder then that drivers come to the conclusion that these arbitrary fines are just a fund raising exercise. DGT deny this saying that the number of fatalities at the wheel have dropped dramatically as a result of their vigilance. From the few responses that I got to my questions, it was clear that the idea of us eating together in the park following a Gastronomic Day was a definite no-no. Regarding whether we would be prepared to take part in the Gastronomic Day, that was less conclusive. However, with only three people saying that they would against those that either would not or were not available, it would be wrong to assume that there would be sufficient support to make it viable. I have therefore contacted the Fiesta Commission to let them know our decision. They may be disappointed but I doubt it will stop them from putting on a good show. The plume of smoke that you may have noticed coming from the direction of Guardamar del Segura was at the headquarters of the Fen Group on Avenida del Puerto de Guardamar. The fire started when a spark from a blowtorch that was being used to repair the roof felt caught the aluminium facade. At first it was only a small fire but then it rapidly spread in the wind. Fire crews from Torrevieja and Almoradi managed to extinguish the blaze within two hours, nobody was injured and the building is still safe for people to work in. Whilst we were up at La Pedrera yesterday, we could not help but notice the disgusting state of the building. When we were first here, it used to be smart, a nice place to go for an al fresco meal. Then they built the barbecues which of course cannot be used during the summer due to the risk of fire. However, young people frequent the place at weekends and the evidence of them being there is all too clear with the graffiti that covers the woodwork inside. The building needs some repair, a good clean up and a lick of paint to restore it back to good condition. Move on then to the duck pond and that shows the same signs of neglect. Hopefully, the clean up campaign that is going on around the town will extend to La Pedrera and we will see the area restored back to its former glory. On the right is Antonio, the teacher and on the left, Pepe. Along with their wives, they prepared a feast for the members of our Spanish class. The main dish was of course, traditional "arroz con conejo" - a speciality of the Vega Baja. Spain is gradually moving over to digital meters to read electricity. The so called "smart meters" are connected using the cable to the internet so that suppliers can read them without calling at your house. They can also monitor outages remotely and of course cut you off if your bills are not paid or you try to exceed the maximum that you are contracted to. Since your standing charges are based on the amount you contract to, people who live in apartments and older houses opt for a lower rating. Newer houses, like ours, have a higher rating to ensure that we can run a full range of washing machines, dishwashers, cookers, air conditioning units etc. Those that have lower ratings who try to use a wide range of electrical devices with the new meters will find that they constantly trip out. Suppliers have until 2018 to replace old analogue meters with the new digital ones. You should receive a letter to say when this will be done and there should be no charge. Those who already have "smart meters" can monitor the amount of electricity that they use and if they opt for the new hourly tariff, they can choose when is the best time to run the washing machine. for example. 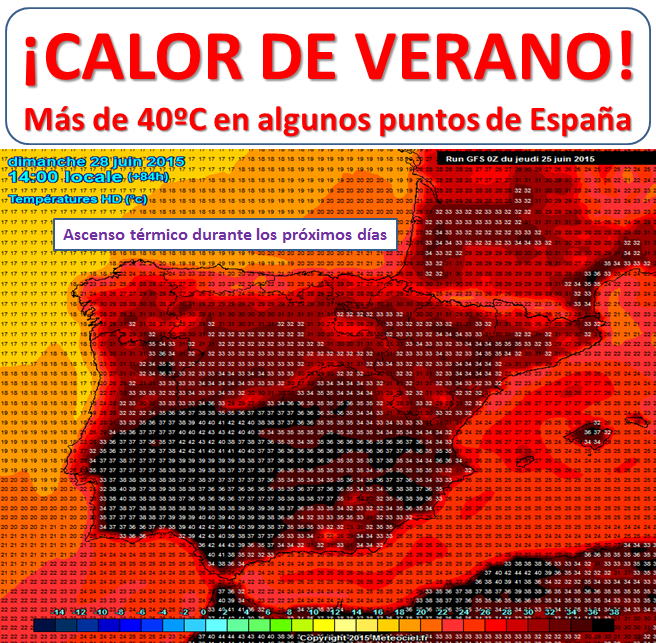 The tariff for each day is available on the website of the Spanish electricity grid (REE) or they can download a mobile phone app to find this information. The idea is that consumers have more control over the amount that they pay by monitoring their usage. That was never possible with the old analogue meters where you had to wait until the bill arrived to find out how much you were being charged. The other advantage of a digital meter is that it should be more accurate. Analogue meters had a tolerance range which could mean that you were paying more or less than you should. Having spoken to a few people, some important observations have been made about the suggestions from the Fiesta Commission. 1. The logistics of taking food down to the park for a Gastronomic Day along with food for a lunch later are difficult. Keeping the food for our lunch fresh for over two hours in August would be near impossible. The only way around this that I can think of would be to return to Villas Andrea after the gastronomic event to collect our food but that would be pointless. 2. Even if we did consider staying, once the Gastronomic Day was over, the area of the park would be littered with rubbish that we'd have to clear up before we could sit down to eat. 3. The tables set out for the British buffet to be served last time were in the full sun. After two hours of standing in the sun, most would just want to get home for a shower and a rest. 4. Unlike the food that the Spanish ladies prepare, our food has to be served buffet style. We rely upon people not to be greedy and take just one plateful. That has never happened, we see people with three or more platefuls of food which they claim are for others. To make matters worse, at the end of the event a lot of that food is left to be thrown away. We are aware that there are many in the town who have little money and rely on charity just to feed themselves. It is therefore criminal to see good food going to waste. 5. There were neither plates nor cutlery provided last time. a) are we prepared to take part in a Gastronomic Day again? and b) do we want to stay after the event for a lunch that we have to prepare? I guess that if we were to agree to take part in the Gastronomic Day we would make the strict provisos that 1) the table where the food was to be served from is in the shade; 2) that a member of the Commission is on hand to ensure that nobody (WITHOUT EXCEPTION) takes more than one plate and 3) plates and cutlery are provided. As for the idea of us staying after the event for lunch, it was a nice idea but I am guessing that most would say it is just not feasible. To save you emailing me or calling around simply answer the two questions in the left hand sidebar. Yesterday, my contact from the Fiesta Commission came up to see me following their meeting. Sunday 9th of August will be a Gastronomic Day. The event, which was dropped last year, will be restored to the calendar i.e. people of all nationalities in the town will be invited to prepare food that is typical of their country. That will take place from about 12am to 2pm. Following that, it is proposed that the Brits from Bigastro sit down to enjoy lunch together in the park. The idea is that we prepare the food for the meal in whatever style we like. Later on there will be a Fiesta Sevillanas, similar to the one last year which we are invited to take part in. You can even dress up in costume if you wish! Normally, at the Gastronomic Days, the Brits prepare a table that groans with the weight of food but then get to eat very little or none of it. We are left to go home for lunch. Cutting back on what we prepare for the Gastronomic Day and sitting down together for lunch together sounds a lot more civilised and would bring us together as part of the Fiesta. Thinking about what we could prepare, I think we should apply the KISS principle and taking account of the weather we can expect, a simple picnic with salad, cooked meats, quiches etc. sounds appropriate. However, I know there are some excellent cooks amongst us with lots of experience in catering who can guide us into the right choices. There is a deadline for our decision about whether to go ahead which is Thursday. 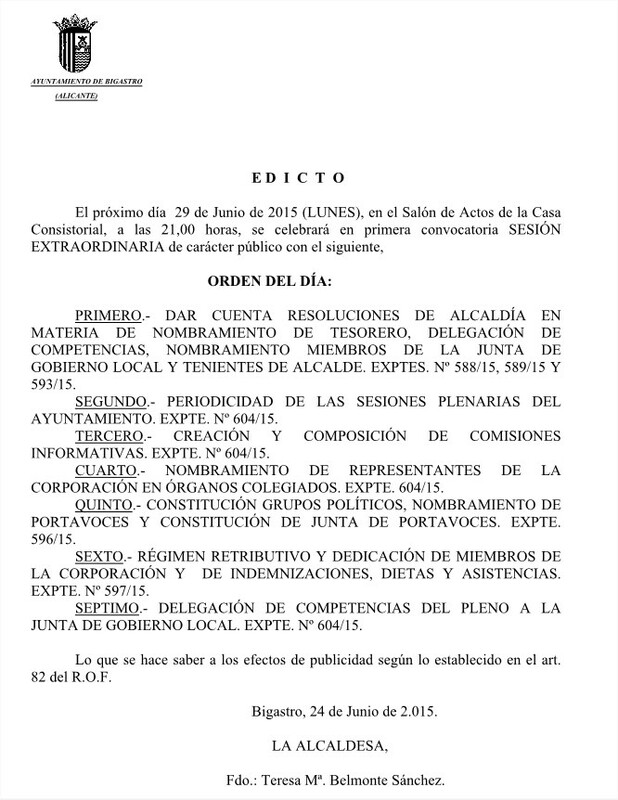 The Commission need the information then so that it can be included in the book that accompanies the Fiesta. So there you have it, now down to us to make it happen. All those in favour say AY! 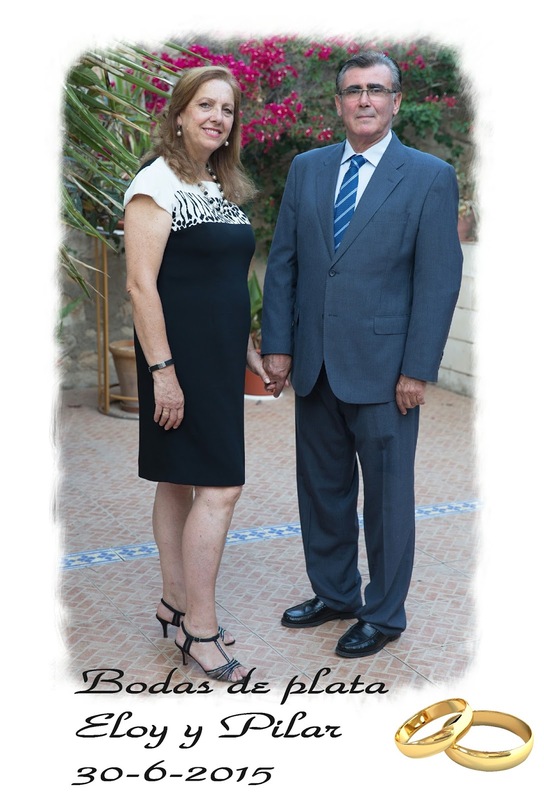 For 27 years, the PP have governed Torrevieja but they did not gain enough councillors at the recent election to hold a majority. On Friday, twelve councillors from five different parties agreed to form a coalition. 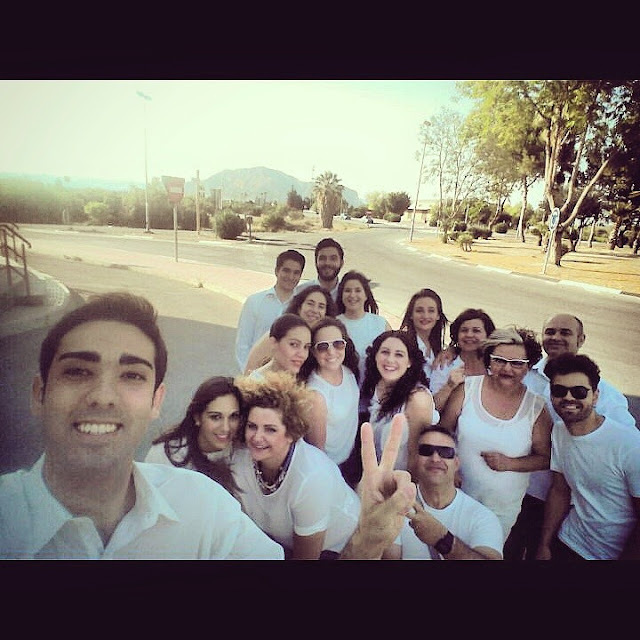 They include PSOE 4, Los Verdes 4, Sueña Torrevieja 2, Aptce 1 and Izquierda Unida 1. Once the councillors were sworn in, they proceeded to vote for the new mayor. Eleven councillors from the PP voted for the outgoing mayor, Eduardo Dolon; the remaining 14 voted for José Manuel Dolon, local leader of the Greens. José Dolon is a 63 year old retired banker who has a lot of experience in local politics and has said that he will rule "from the street". 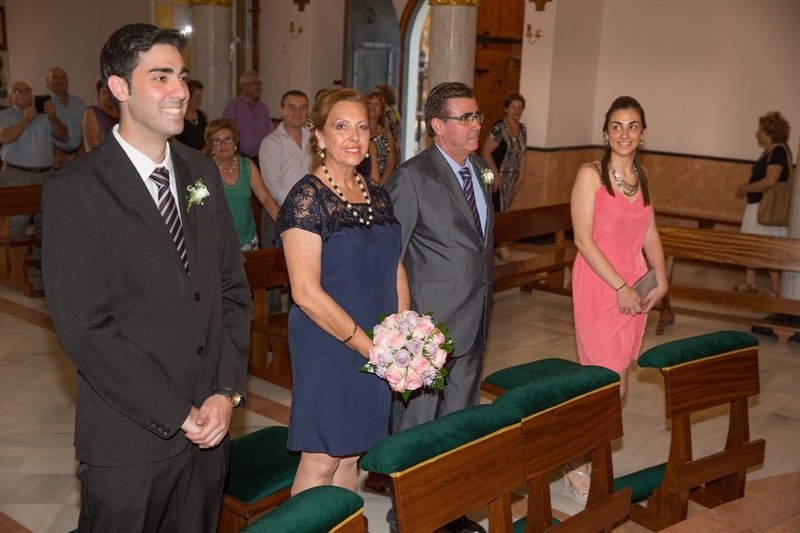 Dolon will be mayor until June 2017 when Fanny Serrano, leader of the PSOE will take over. We all know that coalitions between two parties can become fragile so it is easy to imagine that five parties trying to work together will be a real challenge. Although there may be those who read this blog who did not vote PP at the 2011 election, I feel certain that they would want me to congratulate Charo Bañuls and the other PP councillors on the achievements they made during their four years in office. As I have said before, the town's finances were in a sorry state four years ago. The town was seriously in debt to suppliers, workers, the State - in fact everyone they dealt with. The threat of bankruptcy was very real. The previous council were borrowing money wherever they could just to try and keep their heads above water. Remember the fiasco when the infant school was cut off from electricity and a generator was installed outside? It wasn't just the primary school, there were generators used to supply power to various other council buildings and installations. The town was so heavily in debt to the government that it was not possible to apply for grants so nothing could be done in the town beyond basic services. Today, as they hand over office to their successors, the town is in a much better condition. Whether we support their politics or not, we should recognise the hard work that has gone on to achieve that. Let us hope that the new council can continue to make improvements and restore some pride into the town. If they can do that and at the same time continue to reduce the debt, then they too will have done a good job. On my behalf and I hope on behalf of many others, I would like to thank the outgoing council for their hard work and effort. They can now have a well deserved rest! I received a very nice email this morning from a couple who have a holiday home here at Villas Andrea. They thanked me for my blog and said that they had noticed how much cleaner our estate and the town in general looked. Those who live here will have noticed that further work is going on in the park where the childrens' playground is. Sadly of course, there is nothing that the council can do about the abandoned houses although I have noticed that they have been boarded up to prevent squatters and further vandalism. Keith and Suzanne are right in assuming that there are people on the council who read this blog and take note of what I write even if they don't act upon it. Unwittingly, I seem to have become the unofficial, official spokesperson for the Brits who live here. With regards to the invitation from the Fiesta Commission, Keith and Suzanne say, "We shall not be here in August for the fiesta but do hope that the council do try and get everyone involved and that the English people here actively respond to their efforts." I have to say that I have not received a response yet either way to say whether people are interested or not. I could call a meeting or walk around and ask people personally but that would be putting pressure on my neighbours. I know that many who live here read this blog I therefore thought that this would be an effective way to measure support for the proposal. Many of the fake emails that you get saying your bank account will be closed etc are so obviously amateur. The poor language, the misspellings, the lack of a logo and the address from which the mail is sent are a clear give-away. This one though, looks genuine it even has a verification logo at the bottom. However, it is a fake. 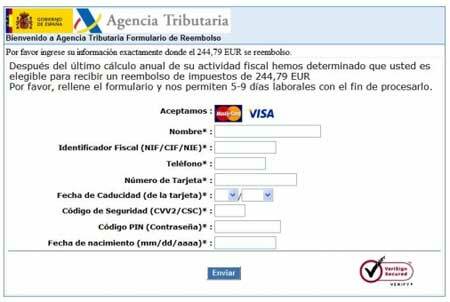 If you reply to it, instead of receiving the 244.79 euros, you will find your account drained. Apart from the fact that Hacienda would not send you such an email, asking for your pin number is a clear indication that you are being scammed. Even when you pay for something over the Internet, you never have to provide the pin number for your card. On Saturday the new council will take office in Bigastro as Charo Bañuls steps down from the position of mayor. At her last meeting she said that she was happy about the work that had been accomplished during her term of office. The town was in a very sorry state four years ago - on the brink of bankruptcy. Although there is still a large debt owing, progress has been made; three quarters of the debts to the Treasury and Social Services have been paid giving the town access to public subsidies again, suppliers are being paid within 60 days and compensation to the dismissed council workers will be paid. Bañuls offered advice to the new councillors not to let their victory in the election go to their heads. They are all new to politics and must take time to settle themselves in. Most important, they must govern for all of the citizens and be aware of the town's situation. With a majority of just one. they will be surely kept on their toes. King Filipe of Spain has taken away the title of Duchess of Palma de Mallorca from his sister, the Infanta Cristina. She ceased to be a member of the royal family following the abdication of King Juan Carlos and now she has had her title revoked. No longer will she receive remuneration from the state. Following the defeat of the socialist party in the municipal elections, Raul Valerio Medina has announced that he is to step down as leader of the party and renounce his position as councillor. The regional executive of the party had asked him to step down before the election - when the list of candidates for Bigastro was drawn up. They feared that the cases that had been brought to court may affect the confidence of the electorate. Whether that was true or not we will never know. He says that he will continue as Provincial Deputy until his term of office runs out in a years time. 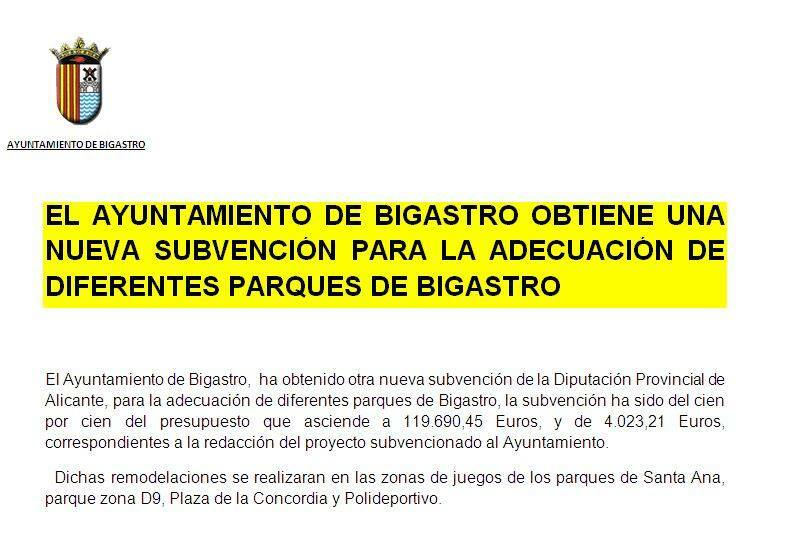 Not only will there be work done on the park at Holy Cross; the parks at Santa Ana, Villas Andrea, the Plaza de la Concordia and the Sports Centre will be getting makeovers thanks to grants of 119,690.45 and 4,023.21 euros that will cover 100% of the cost. When the PP said that they will clean up the town, they meant it. The grants have only been made possible because the council have largely cleared their debts to the Treasury. Saturday will see the new council sworn in. From then they will start to put their plans into place so that we can judge whether they keep to their election promises. Since the reforms on three of the parks in Bigastro, the Ayuntamiento has applied for more grants. Next in line is the park at the Barrio de la Cruz where the pine trees are in a dangerous situation and the childrens' playground is looking shabby. A technician from the Province has already visited to prepare an assessment of the work to be done. This morning I met up with a member of this year's Fiesta Commission. We chatted about the fiesta for San Joaquin this year and he told me that the commission are very keen to put on a programme that will be good for all members of the community; young, old, Spanish and British alike. They are aware that we are, to some extent, left out and want to put that right.To this end, they have been discussing the possibility of a special event for the British community and wondered what we would appreciate. 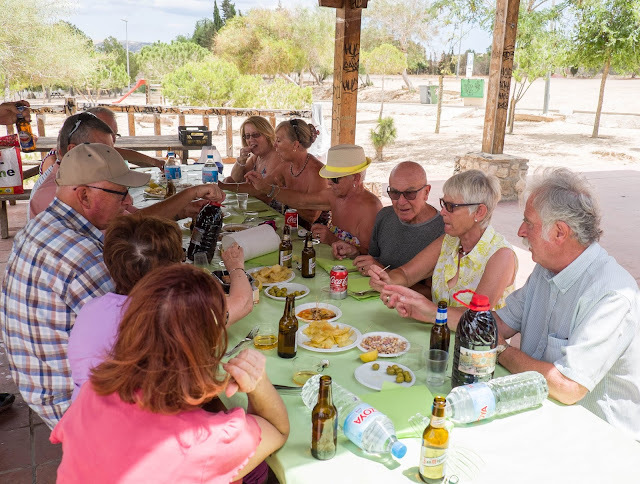 The suggestion made was for a special meal during the week for us - either in the park or one of the streets but not at Villas Andrea because the idea is to integrate the British community more fully into the Fiesta. I was asked to sound the idea out with my neighbours and let the Commission know how we felt. The food could be either British or Spanish, that would be up to us to decide. NB I will need to let them know pretty soon so they can incorporate it into the programme and of course the book that will be published. Talking of the book, I pointed out that we are often missed out when it comes to receiving copies and was assured that this year someone will make a point of visiting Villas Andrea to pass them on and of course to receive voluntary donations. When they come around we should remember that the Fiesta Commission receive only a small amount of money from the Town Hall and so rely upon donations to stage events during the week. The Guardia Civil and the National police warn us about various scams on social network sites including Facebook and Twitter. There are also warnings about fraud being attempted on WhatsApp. On Facebook, the scams usually take the form of a raffle for a new mobile phone or offers of cheap sunglasses. Basically, any offer that is too good to be true is usually just that. You are normally asked to give information to take part in the offer which the crooks will then use against you. Although these services and the Internet in general are invaluable tools in our modern day lives, they are also a great place for crooks to try and con us out of money. In England, when a new government or council is elected, they take office straight away. The municipal elections in Bigastro took place on the 24th May and yet the councillors from the previous mandate still seem to be in power. At the celebrations for Corpus Christi, it was the Charo Banuls who sat at the front and her name still appears on the list of officers along with others who are no longer councillors.. So when will the new council take office I wonder. Will it be at the next council meeting which is scheduled for the 10th June at 1pm? It is likely that every town and city in Spain will have celebrated Corpus Christi this week. Some will have done so on the actual day (Thursday); others, like Bigastro, will have waited to the weekend. When we first came, Corpus Christi was an important celebration here but there was not the endless preparations that we have now. Those who went down yesterday will have been impressed by the lengths people went to in an attempt to make the day special for the young people taking their first communion. 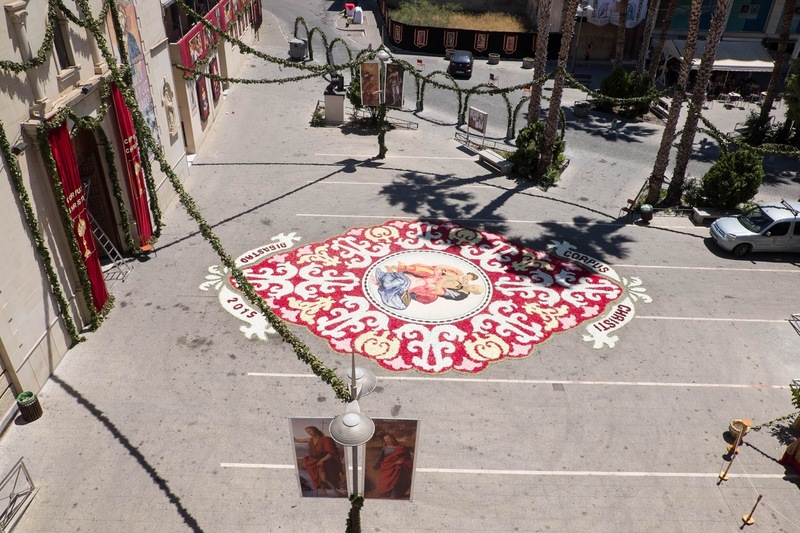 There was an extraordinary amount of effort made, ranging from the banners and pictures around the town square and along the route that the procession took to the floral carpet that was laid out in the square. You can see my photos from the day in the album linked to from the sidebar. Just to whet your appetite, here is a shot of the carpet once it was completed. To judge the size of it, use the parked van to the right of the picture. What were those four aircraft doing flying overhead in formation yesterday? They were taking part in an event at La Murada, outside Orihuela where hundreds paraded before the Spanish flag to show their allegiance. It was the Air Academy from San Javier Air Base who put on the display, the highlight of which was a parachute jump from 1,200 metres. Three paratroopers criss crossed the sky before landing on the same precise spot – the last one carried the Spanish flag. Even if you weren't following the match last night, it was clear which side had won as minutes after the fireworks started here in Bigastro. Both Barcelona and Juventus were chasing a treble but only one team could achieve that aim. Barcelona looked as if they were going to romp home by opening the scoring after just five minutes. Juventus held on though and managed to equalise after half time. Although Lionel Messi's superb shot on goal was saved by the Juventus keeper, Suarez picked up the loose ball and drove it to the back of the net to make it 2-1. By then it was almost certain that Barcelona were going to grab their fifth Champion's League trophy, their third in six years and Juventus would lose for the sixth time. Neymar finished things off late in the game to give Barcelona a 3-1 win and then the fireworks started. Last night's concert for Corpus Christi had been moved forward a day to accommodate the Champions' League final that will take place tonight between Barcelona and Juventus. That cut back the time for a final rehearsal to add extra polish to the performance. Whether it was lack of rehearsal or nerves, the first two pieces did not highlight the band at their best. Since I was moving around taking photos from the sides and the back, I could't hear the full effect but what I heard sounded lacklustre and "off key". Once the band got into its stride things improved and by the final piece they were back on top form leaving the audience satisfied. I can confirm that the procession for Corpus Christi in Bigastro will be on Sunday. Those of you who have visited the town in the last couple of days will have seen the preparations taking place. On Sunday morning they will start laying out the carpet which forms the centrepiece in the square by the church. The picture which forms the central part of the carpet has already been produced using dyed grains of rice. The surrounding will be made up of greenery and flower petals laid out from large paper drawings transferred with chalk to the paving. It is a time consuming process that requires two things, a lack of rain and no wind. Sunday evening there will be a special mass in the church followed by the candle lit procession around the town. Mass will be at 7:30pm. Trust the DVLA to cause chaos just as the holiday season starts. They decided to abolish the paper counterpart of the UK driving licence and instead keep the record of endorsements and offences centrally on their database. Those who still have the paper counterpart are advised to destroy it. NOTE: Those who still drive with a paper licence should not destroy that and yes, in spite of what some newspapers tell you, those licences are still valid in the UK at least. The problem is that some rental companies abroad ask drivers for the paper part of the licence before allowing them to drive a car away. Those who no longer have this information may be refused. DVLA have come up with a workaround which involves the driver logging on to the DVLA website with their driver licence number and their National Insurance number. The system should then generate a code which the driver can give to the person at the rental desk. This will allow them access to the driving record and view the details that were previously on the paper part of the licence. There is a snag though - the code is only valid for 72 hours. So, for those who are hiring a car later in their holiday, it won't work. They will have to find some means to log on to their account and generate a new code or hope that the rental company are willing to pay for a premium-rate call to DVLA and hang on until their call is answered. Of course, many rental companies abroad will be unaware of the changes and may still try to insist on seeing the paper counterpart causing stress and anxiety for the hapless driver. Why couldn't DVLA introduce this change in the quieter winter months so that it was up and running before the peak season? Most tourists to Spain will tell you that gastronomy is not the country's trump card. If you want good food, you'd be better off going to France or Italy, even Britain. That is probably because most of the restaurants serving tourists have a similar menu of traditional Spanish dishes including of course paella. Search further though and you will find restaurants at the vanguard of haute cuisine; preparing imaginative dishes that can compete with the best in the world. The proof of that comes with the list of the World's 50 Best Restaurants. Last year Noma, the Danish restaurant that serves items like deep-fried moss, came top. This year the Spanish restaurant El Celler de Can Roca pushed Noma into third place with Osteria Francescana taking second place. The top British restaurant, Heston Blumenthal’s Dinner, only managed seventh place and there was an absence of French restaurants in the top 10. 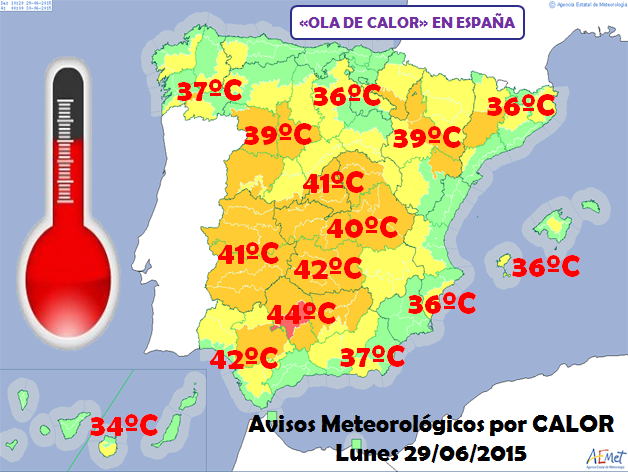 So where is El Celler de Can Roca? In Girona, Catalonia - run by three brothers who produce food described as “imaginative” by Michelin who gave it three stars in 2009. There are only places for 45 diners so there is a backlog on bookings meaning you will have to wait at least seven months for a table. Out of 1,072 reviews on Trip Advisor, 931 gave it five stars and raved about the 300 euro meal they had enjoyed. The concert for Corpus Christi will be on Friday, not Saturday as previously advertised. Note also that it will be in the town square and not in the Auditorium as it has been in previous years. The concert will start at 10pm. Corpus Christi itself is Thursday, 5th June this year so I expect the celebration will be on Sunday 7th. I will find out for sure this afternoon. Those who saw my pictures from last year will know just how much effort goes into making this celebration so special and how colourful the area of the town square will be once they have decorated it. A pair of guitarists played, two young ladies acted out the story and a choir of children sang. They kept us entertained for an hour and had the audience in the Auditorium cheering. Don't ask me what the story was about, I was too busy trying to get some decent photos! You can see the results by going to my album in the sidebar. You can also download the songs by going to https://www.dropbox.com/s/shb6na8p9fdd1up/Songs.wma?dl=0. My friend Christopher, who lives in Los Desemperados, asked if we had the thunderstorm early Sunday morning. I was pleased to tell him that we had rain but no thunder. 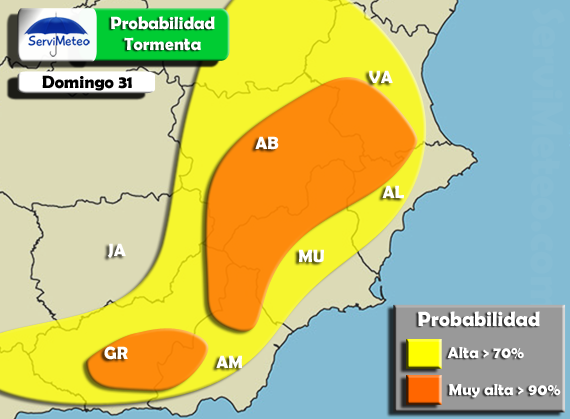 In Murcia, the storm was accompanied by hailstones - hailstones at the end of May! !